When things get too stressful or we feel overwhelmed with everything that’s going on around us, a common piece of advice we get is to cut out all the unnecessary stuff and strip down to the bare essentials. This process takes us to the core of our lives, and gives us a renewed look at our priorities. And that is exactly the spirit with which Dutch artist Piet Mondrian painted his artwork that consisted basically of lines and primary colors. But Mondrian didn’t always paint like this. He started out painting in a more natural form, but his introduction to other works of modern art, particularly Cubism, transformed his outlook. He began to reduce everything he saw to the very basics and created compositions that used horizontal and vertical lines along with colored squares. Now, in a world filled with distraction, we can imagine how hard it is to look at something like that! 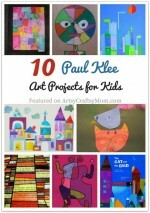 But you can, with these awesome Piet Mondrian’s projects for kids. The geometric nature and primary colors of Mondrian’s art lends itself perfectly to Lego bricks! 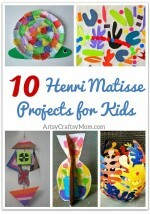 Mama Miss comes up with this ingenious idea and creates some simple printables for the same. Just download them, gather your bricks and go! Since Mondrian’s art is all about lines, craft sticks are a great way to create your own custom Mondrian patterns. Laly Mom shows how you can create simple pattern sticks and then put them together to make your own grid-art. When we’re talking about a famous painter, an art lesson comes without asking! Harrington Harmonies uses tissue paper in blue, red and yellow along with black construction paper to create some pretty impressive looking art work! 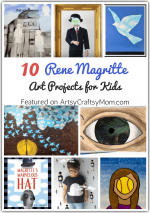 Looking for a resource to explore Art Appreciation with kids? Click the image below, enter 0$ in the price & download our Printable ‘Famous Artists’ Mini Cards & Art appreciation Worksheet for free. Mondrian’s art was all about reflecting the true nature of things, so how about a project that helps a bit of nature to stream through? Yes, we’re talking about a cool sun catcher art, featured on School Time Snippets, that even toddlers can make! When you’re an artist, the more unconventional you are, the better. 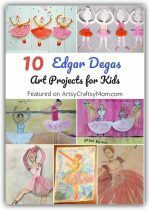 This foil art from Art Projects for Kids is in this spirit and uses quite a few unusual elements; check it out to know more! Who would think that a bunch of sticky tape in different colors could create art? That’s exactly what this project from United Art & Education does! This is a simple, mess-free project perfect for a lazy weekend! Mondrian’s original paintings were bought by the rich and famous of New York and Paris, but you can gift your own Mondrian-inspired work for free! Try out this cute little sharpie painting on an easel, featured on Art Projects for Kids. Linus is a boy who delivers groceries to a famous artist, known only as Mister Orange. Linus is captivated by the geometric lines and bright colors of the artist’s work and they inspire him to think and question various aspects of life. This is a book that’s more suitable for older kids and presents an interesting view of the artist. If you have a tween who loves crafting with mason jars, then this is the perfect craft for her! These Mondrian inspired mason jars from Mason Jar Love also make lovely gifts, especially for art lovers. How cute is this Mondrian-styled toy?? And you can make your own too, just download the printable from Toy-A-Day and fold according to the lines. They have other artists’ toys too, so go ahead and make a full set! Kids are known for their tendency to take people as they are, without all the restrictions imposed upon by society. That is probably why the basic nature of Mondrian’s work appeals so much to them. 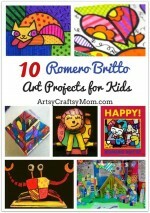 Most of these crafts can be done by preschoolers, may be even toddlers. So gather your brood and create some color! 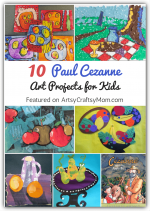 Looking for a resource to explore Art Appreciation with kids? Click image to download our Printable ‘Famous Artists’ Mini Cards & Art appreciation Worksheet for free.